The Predator isnt a bad SSD, but the price is too high for the level of performance it delivers. (+) Great Find: Faster than SATA; high endurance; HHHL adapter for older systems. (-) NeVer Mind-e: Not as fast as other PCIe offerings; expensive; short warranty; no NVMe support. With all the hullabaloo about M.2 PCIe SSDs and NVMe, users of older systems might feel left out. 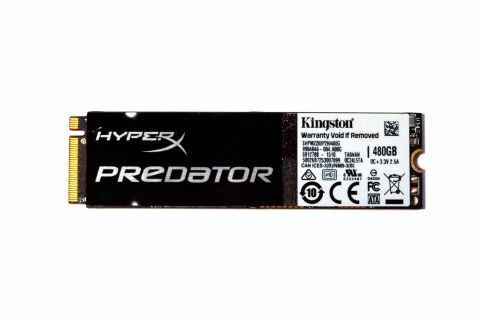 Enter the Kingston HyperX Predator, with an optional half-height, half-length (HHHL) adapter card that allows anyone with a spare PCI Express slot to use an M.2 drive. There’s nothing revolutionary about the adapter card, as it just converts up to four Gen3 PCIe lanes into an M.2 connector, but it opens the M.2 doors to virtually any recent desktop. The question of course is whether or not you'd actually want to use an M.2 drive via an adapter instead of just grabbing a native PCIe SSD like the Intel SSD 750, but whether or not you have a motherboard with an M.2 slot, it's a viable option. Unlike the Intel SSD 750 and the Samsung NVMe drives, the current Predator uses the established AHCI protocol. That means you can use it as a boot device, where using an NVMe SSD as your OS/boot drive requires that your motherboard BIOS supports NVMe. This makes the Predator more compatible with a variety of systems, but it also makes it potentially slower. Kingston is working on an NVMe version of the drive as well, though it's not ready for release yet. Checking out the specifications, one impressive statistic on the Predator is the endurance rating. Kingston specs the 480GB model we’re testing at a whopping 882TB total bytes written, which equates to 1.7 drive writes per day (DWPD). Even the heaviest of home users is unlikely to be writing 800GB of data on a daily basis, so it’s highly unlikely anyone will be burning through all the NAND cycles. We have to temper the high endurance rating with a less impressive three year warranty, however; many other SSDs carry a five year warranty—not that the warranty will do you any good if your drive fails and you lose data, so make sure you keep a good backup strategy in place! The remaining specifications are decent but nowhere near class leading. Of note is the high power use, which may make the Predator less than ideal for notebooks even if they have the requisite M.2 PCIe slot. The IOPS ratings look promising, though it’s interesting that the smaller 240GB drive sports higher values, indicating perhaps that the Marvell controller isn’t tuned for larger drive sizes. Finally, the maximum throughput is only about twice that of a good SATA drive, and clearly behind the current market leaders (Intel SSD 750 and Samsung SM951 NVMe). Where things really get dicey is the pricing. The Predator initially launched with MSRP well above $1 per GB ($746/$364 for the 480GB/240GB drives, not including the adapter card), but that was thanks in part to its early-adopter M.2 PCIe status. With more competition available, prices have dropped to under $1 per GB now, and interestingly you can actually get the 240GB drive with the adapter for less than the price of the 240GB M.2 card alone. The problem is that Samsung’s SM951 (NVMe or AHCI) sports much faster specs, and while the 256GB model is more expensive than the 240GB Predator, the 512GB model costs substantially less than the 480GB Kingston drive—and you get 32GB of additional storage capacity as an added bonus. As noted in our revamped SSD test suite article, we’ve updated to a new test bed for storage, running a Skylake processor in a Z170 motherboard. Here are the details of our test system, followed by the benchmarks. Details on how we test SSDs are available here. With the SATA bottleneck out of the picture, M.2 SSDs can stretch their wings and fly… at least to the limit of their abilities. This is where the Predator runs into problems, ultimately falling prey to the substantially faster NVMe drives. While the Predator numbers look good compared to any SATA drive, it falls far short of the Intel SSD 750 and the Samsung SM951 NVMe. We measured 109K 4K read IOPS, which is close to Kingston’s rated throughput, but only 60K write IOPS—well off the 118K rated value. In general, the Predator ends up delivering roughly half the maximum performance of the SM951 and SSD 750, which really hurts when coupled with the lower price point of the 512GB SM951. Another comparison point is the two Samsung 850 EVO 250GB SATA SSDs in RAID 0. These run neck and neck with the single Predator, often beating it in random IO workloads. The mixed random IOmeter results are particularly bad, with the Predator falling well behind even single SATA SSDs. In our real-world file copy test, it still manages to claim a third place finish, and PCMark 8 illustrates yet again that for everyday tasks there’s only so far a fast SSD can take you. But if you’re paying top dollar for an SSD, chances are you’d also want a top performing SSD. This just goes to show that using the latest technology as a basis for your next buying decision can often lead to disappointment. The Predator has actually been out for a while now, and it was one of the first M.2 PCIe SSDs to hit the market. Unfortunately, while it’s generally faster than any individual SATA drive, the Predator falls well short of the potential that M.2 PCIe offers. The Intel SSD 750 and Samsung SM951 NVMe easily surpass the performance of the Predator, and they do so without carrying a substantial price premium. Or if you don't need or want NVMe, the existing Samsung SM951 also delivers better performance. With the Samsung 950 Pro set to launch next week at even lower prices than the SM951, the writing is on the wall: Kingston needs to cut prices on this drive to keep it relevant. That’s the good news, though: With the only real difference between the Predator and other SSDs coming in the form of the controller and interface—items which shouldn’t dramatically affect the cost of producing the drive—there should be plenty of room to lower the price. We’re giving the Predator a 65 based on the performance and current pricing, but if it should drop to just above SATA price levels—say, $0.50 per GB—we would be less critical.